Free download Arduino Builder latest version. Arduino Builder is a fully standalone utility for viewing, compiling and uploading Arduino sketch file and compiled ELF or HEX file (usually bootloader) to Arduino board with Arduino serial programming interface, USBasp or Arduino ISP, without the need for Arduino IDE. This can be easily done with no more than 3 steps. When compiling is required (for uploading sketch file), the utility scans the sketch for referenced libraries and build the necessary libraries automatically. 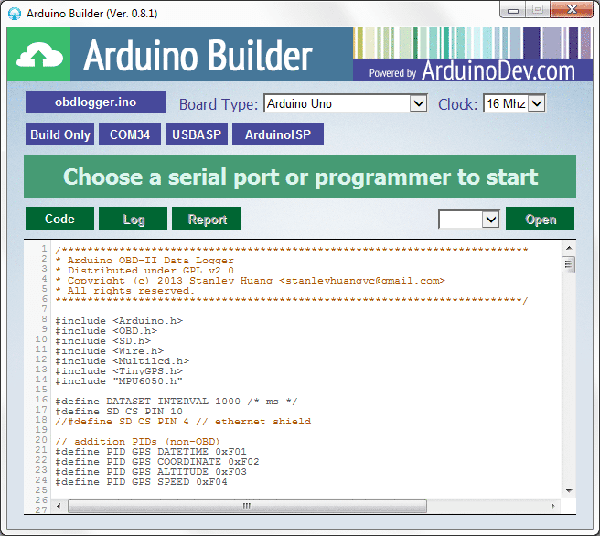 Arduino Builder comes in GUI (graphic user interface) version, for normal end users, and CLI (command line interface) version, named Arduino Uploader, for integrating into 3rd-party applications. The distribution package contains Arduino 1.0.4 core and library files, AVR GCC compiler toolchain and AVRDUDE. As only the standard Arduino libraries are shipped with the utility, in order to build with custom libraries, please place the library source code files (with identical directory name) in <install dir>/arduino/libraries directory, as what is done with official Arduino IDE.